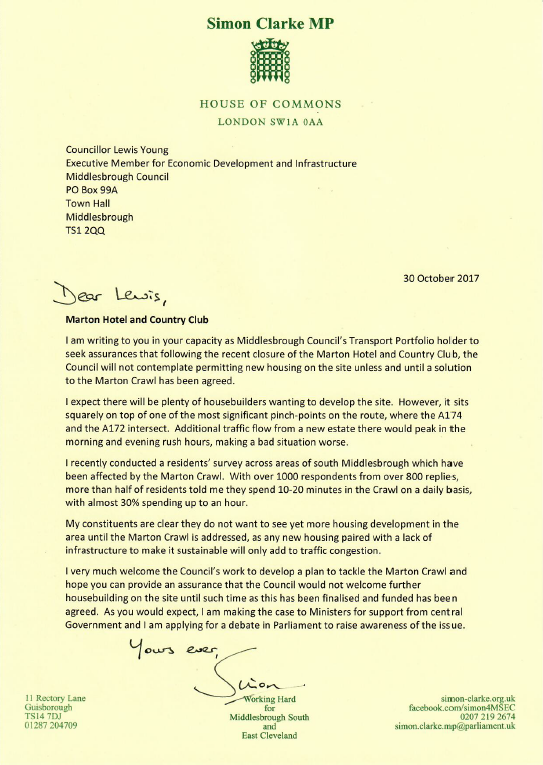 Simon Clarke MP has told Middlesbrough Council no housing development should go ahead on the site of the Marton Hotel and Country Club until measures have been put in place to tackle the 'Marton Crawl'. The well-known hotel closed its doors earlier this month and its future is unclear. Now Mr Clarke has written to Councillor Lewis Young, the Council's Transport Portfolio holder, to seek assurances the Council will not allow developers to swoop. Mr Clarke, who is campaigning to deliver Government investment to improve traffic on Marton and Stokesley Roads, recently held a residents' survey on the issue. In his letter to Councillor Young he says that local people told him the issue is a serious concern, half of whom are spending 10-20 minutes a day queuing in the Crawl and 30% queuing for over half an hour. Simon Clarke said, "The Country Club closing marks the end of an era and I expect there will be plenty of housebuilders wanting to develop the site. In my view, it would be totally unacceptable for the Council to allow development there unless and until the town has a proper plan in place to tackle the Marton Crawl. "The Country Club exits right onto the Marton Crawl at one of its busiest points by the Parkway sliproads, and adding hundreds of homes there is the last thing we need at the moment. I've challenged the Council to confirm this is not on the table until the problem is sorted. Local people couldn't be clearer: the Marton Crawl is a blight on their lives and they want to see action before any more new homes." A new Government fund to deal with traffic bottlenecks was announced by Transport Secretary Chris Grayling this summer and will open for bids next year.